A special University of Edinburgh exhibit offers a chance to view one of the library’s most bizarre and fascinating artifacts: a letter, stashed in a Victorian-era scrapbook, written in the blood of William Burke — half of the murdering-for-profit duo commonly referred to as Burke and Hare. The scrapbook was thought to be kept by a local medical student with a keen interest in the crimes, according to the History Blog, which sadly notes that the Edinburgh event (which takes place May 15-17, and also includes glimpses at rare books connected to Sir Arthur Conan Doyle) is sold out. We wouldn’t have been able to make it anyway, being all the way in California, so we’re OK with learning about its most unusual attraction long-distance. Their purchaser was Dr. Robert Knox, a well-regarded anatomical lecturer with a flourishing dissecting establishment in Surgeon’s Square. The ensuing criminal investigation and trial raised troubling questions about the common practices by which medical men obtained cadavers, about the lives of the poor in Edinburgh’s back alleys, about the ability of the police to protect the public from deliberate, unprovoked murder for gain. The murders were discovered when two of Burke’s lodgers, Ann and James Gray, grew suspicious about the unexpected disappearance of a visitor, Madgy Docherty, whom they had met in Burke’s house the night before. They found her dead body under the bed and went for the police. After Burke, Hare, and two other accomplices — Burke’s mistress and Hare’s wife — were arrested, Hare testified against his partner and was granted immunity (he returned to Ireland and lived a low-profile life thereafter). Burke was found guilty and hanged in January 1829. As it happens, his body was dissected, though not by his best customer, Dr. Knox. He was picked apart at Edinburgh Medical College by Alexander Monro, who took it upon himself to write a letter in the dead man’s blood. This is written with the blood of Wm Burke, who was hanged at Edinburgh on 28th Jan. 1829 for the Murder of Mrs. Campbell or Docherty. 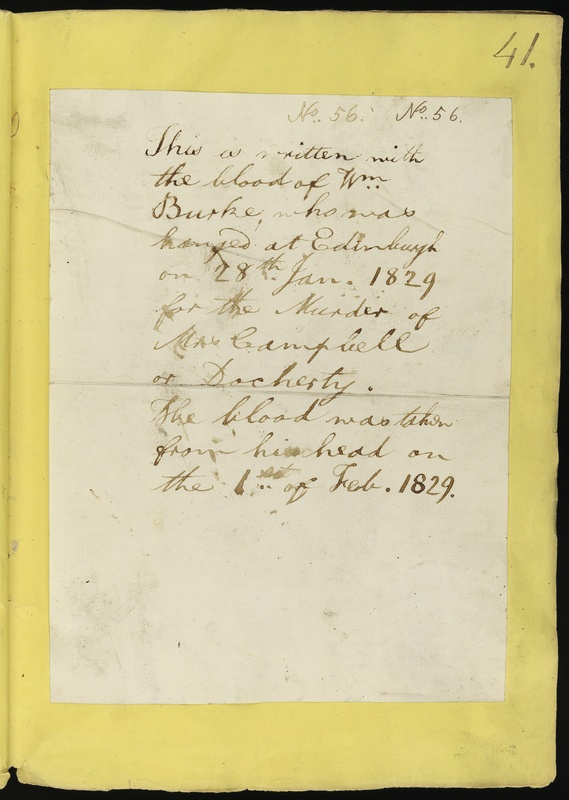 The blood was taken from his head on the 1st of Feb. 1829. Monro’s letter made its way into the scrapbook along with news stories, songs and other references to the murders, trial and execution. It will be on display along with a petition signed by medical students around the time of the murders demanding more bodies be made available for anatomical studies. Ultimately the Burke and Hare murders solved the cadaver bottleneck once and for all. In 1832 Parliament passed the Anatomy Act allowing any unclaimed bodies to be given to medical schools for dissection before burial. The strange tale of Burke and Hare, who also dabbled in grave robbing before making the full segue into murder, has continued to fascinate for obvious reasons. It’s also resonated throughout pop culture, with the most recent rehashing being a comedic version starring Simon Pegg and Andy Serkis as the dastardly duo — and Tim Curry as the letter-writer, Monro.